The 10th annual BlueTech Week in November 2018 was our best ever, but don’t just take our word at face value. Review the numbers and read what attendees had to say below! “iXblue was first invited to BlueTech Week in 2017. We were so impressed by the quality of the audience, the common will to drive a sustainable blue economy, and the business opportunities we found there, that we became a TMA member and made a point of coming back this year. “With each successive annual conference the broad impact that is enabled through the BlueTech Week grows exponentially. This conference provides an efficient, real-time, conduit through which government, industry and academia collaborate to understand and identify current and future societal needs and potential solutions. The unique structure of this conference connects policy makers, public service institutions, academic institutions, entrepreneurs’ and industry. BlueTech Week is all about the companies and the people driving the sustainable Blue Economy. It's the annual event where hundreds of senior international participants gather in San Diego to highlight collaboration and innovation in sustainable ocean and water technologies and the entrepreneurs making it happen. Registration NOW CLOSED for BlueTech Week 2018. The 2019 edition registration will open Summer 2019. Check back for details. BlueTech Week attracts a growing audience from across the United States and globally for a series of intimate executive level events that bring together representatives of academia, industry, and policymakers ("the Triple Helix"). For a partial list of previous attendees, click here. Starting in 2018, TMA is using an event app that enables attendees to connect directly with attendees, exhibitors, speakers and sponsors. For instructions on how to download the app, click here. BTW2018 included a 2-day Tech Expo as part of the BlueTech Summit, on Wednesday, November 7th and Thursday, November 8th. BlueTech Week is not a trade show, but the tech expo provides an opportunity for 35-40 table-top exhibitors to showcase their organization during breaks, lunches and networking sessions among key participants. Click Here for a list of exhibitors. Contact TMA Project Consultant Melissa Fischel at MAFischel(at)themaritimealliance.org to discuss opportunities to exhibit. BlueTech Week is an opportunity to be recognized as a distinguished innovator or leader in your field by sharing your capabilities, ideas, experience, and research with an international audience! BTW2018 will offer a variety of tracks focused on Marine Debris Solutions, Aquaculture/BioMarine, Maritime Robotics, Offshore Renewable Energy, Water/Waster Water Technologies and Workforce Development. Click here for an updated list of speakers. 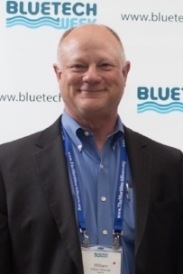 BlueTech Week is presented by The Maritime Alliance, which is the non-profit organizer of San Diego's ocean and water technology (BlueTech) cluster and the largest BlueTech cluster in the United States. BTW2018 would not have been possible without its generous sponsors. "United Nations Sustainable Development Goals & Industry Solutions"
The 10th annual BlueTech Week is a value-added networking conference that connects senior officials from around the world who are looking for innovative solutions and collaborative opportunities for business development, economic development, and workforce development in a sustainable Blue Economy. The Blue Economy includes both traditional maritime industries and innovative BlueTech sectors such as alternatives to fishing and netting gear, biomimicry and biomedicine, electrification of marine vessels, maritime robotics, offshore renewable energy, remotely operated vehicles and sustainable seafood. While maritime is one of the oldest industries, the traditional industry has been slow to innovate and yet very few regions are currently focused on the fast-growing, innovative BlueTech sectors. This is beginning to change as ports and regions around the world are promoting sustainable ocean and water industries that optimize conservation and promote economic development. The growing Blue Economy is just beginning to gain recognition globally as regions start to recognize the importance of the ocean for economic development, recreation, sustenance, and quality of life purposes. The role of the ocean in our daily lives will continue to grow. When we think about the “Big 5” issues for human life—water, food, medicine, energy and “real estate”—we are really thinking about the ocean. The Blue Economy represents the sum of economic activity related to the ocean and water in all its forms, with an increasing interest to further develop emerging industries in ocean observation, renewable energy, and other sustainable uses of the ocean to optimize conservation and economic development. The global ‘Ocean Economy’ is valued on a conservative basis by the Organization for Economic Cooperation and Development (OECD) at $1.5 trillion (2010) and growing to $3.0 trillion by 2030, on a “business as usual” basis. The global water and wastewater technology industry is valued at approximately $500 billion for a total Blue Economy of $2.0 trillion, and yet there is little recognition of this. Consisting of 7 events over 5 days, #BlueTechWeek attracted 550+ participants from 16+ countries, 140+ companies and leading experts from academia, finance, government, and industry. The theme of #BlueTechWeek in 2018 was "United Nations Sustainable Development Goals - Industry Solutions" with specific areas of focus include Marine Debris Solutions, Aquaculture/BioMarine, Maritime Robotics, Offshore Renewable Energy, Water/Wastewater Technologies and Workforce Development. What are the United Nations Sustainable Development Goals? They are an important global initiative focused on 17 themes that promote sustainable economic development. Click here to learn more. BlueTech companies and academic researchers have developed technologies to monitor and observe the earth's natural systems and are responsible for having developed our understanding the environmental challenges we face. We believe that BlueTech will also provide the critical solutions to help address these problems and foster a sustainable Blue Economy. BlueTech Week connects a sustainable Blue Economy globally year-after-year. Be sure to download the event app to assist with planning your visit and for easy access to event details, instant reminders, discussion items, a list of attendees, exhibitors, speakers and sponsors (available late September). Last year, BlueTech Week brought over 480 leading professionals from 16 countries, 95 companies, 18 BlueTech Clusters or "clusters-in-formation" from 11 countries and 7 U.S. states to promote BlueTech and Blue Jobs through 7 events over 5 days. With 7 events over 5 days, BlueTech Week will take advantage of multiple locations and venues in San Diego including conference space at The San Diego Foundation, UC San Diego Scripps Institution of Oceanography, and the NEW InterContinental Hotel in downtown San Diego.